Brianna and Eric played a show together – albeit in different bands – in 2013. While Brianna’s band was playing, Eric said he remembers being instantly drawn to her stage presence. Eric’s band played last and although Brianna was packing up her gear at the same time, she remembers being equally drawn to his stage presence. “[I] remember thinking that I’d never met anyone like him before. I had no idea whether I’d ever see him again until he found me on Facebook,” Brianna said. Eric admits searching for Brianna’s Facebook through the band’s page and asking her to meet for coffee sometime. Fast forward four years and they have become a duo both on and off stage. Their collaborative efforts are essentially effortless as they have the balance of professional and personal down to a science. They make all of their decisions together, eliminating the chances of rising tension. When they aren’t collaborating on music together or working to better themselves as musicians, they’re attending shows together. Music has played an important role in both of their lives growing up, from first cassette tapes to first piano lessons, and they haven’t let that importance diminish in their lives today. Their first song, “Video Daydream”, was indeed a daydream as far as the construction of the record. It is the first song they recorded together that made it past the cutting room floor. The original concept of the song took on a whole new vibe as it went from a Casio SK-1 drum sample to an orchestral arrangement featuring Alex Cheung. The simplicity of the song pieced together with the array of bigger ideas makes for a massive first single. 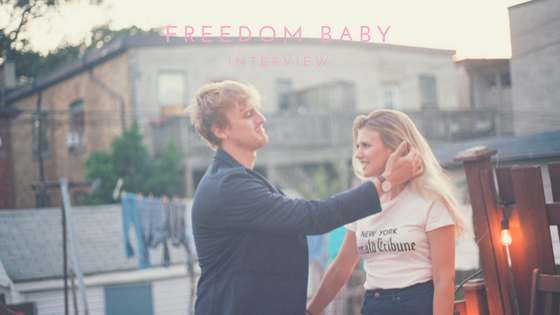 Although a release date hasn’t been confirmed for the first Freedom Baby album, know that it is sooner rather than later. The supportive and collaborative environment that they’ve created for themselves has given them the freedom to work on this album at their pace and on their terms. From admiring each other on stage in 2013 to sharing their lives with each other today, Brianna and Eric’s on and off-stage chemistry is just the right formula.